I've gotten rather fond of holo's lately and Treasures by Tanya has provided some of my faves. 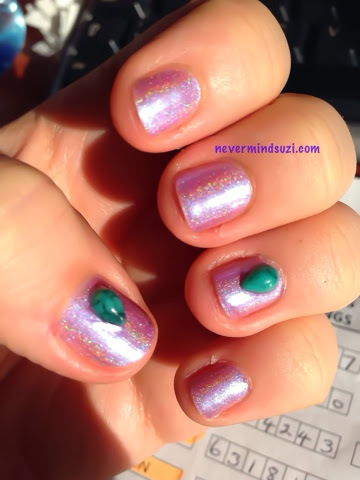 Hypnotiq Blush has pink and lilac tones and that beautiful holo sparkle! I love Born Pretty Store and added these gorgeous droplet shaped stones. I managed to find some actual sunlight and snapped these pictures, doesn't this look gorgeous with those rainbows! I can't believe how pretty this holo looks in the sunshine, it's a shame it's such a rare occurrence.